The other worldly rock formations, deep canyons and immense sandstone cliffs that surround Moab are proof that nature creates art. However, the pre-historic and historic beings that inhabited the area thousands of years ago, took it one step further, and used the rock as a canvas to tell their stories. Rock art, known as petroglyphs and pictographs, was used by culturally diverse pre-historic people world-wide. Archaeologists have determined that the drawings initially were used to depict religious ceremonies and rituals but evolved from there to include solstices and equinoxes, migration routes and successes with harvests and hunting. Petroglyphs and pictographs are abundant in the southwest desert region, especially the Four Corners, which also extends north to include Moab. Pictographs are stories that are drawn on the rock surface using the elements of nature to serve as paint, such as charcoal, minerals and dyes found in native plants. Petroglyphs have been scratched into the rock to remove the outer layer, or patina, which reveals the lighter rock underneath. Oftentimes you will see both methods used concurrently. Petroglyphs have survived the ravages of time since they are engraved and not drawn. 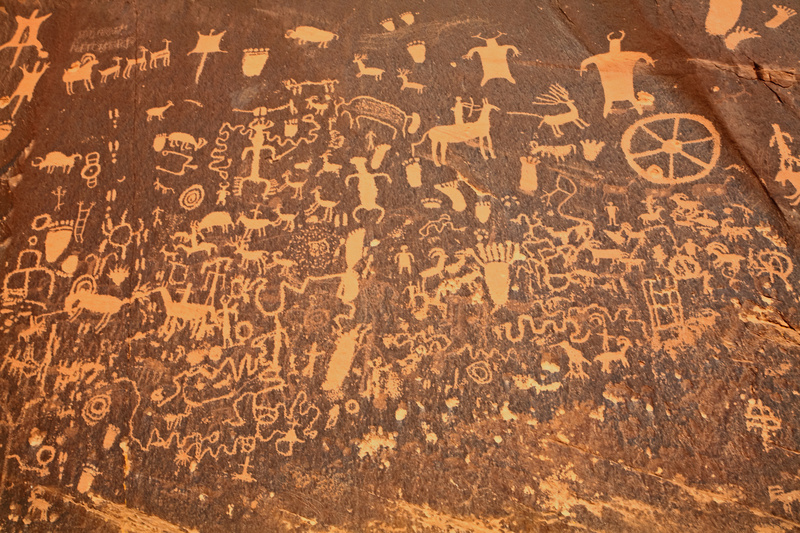 The rock art found in the Moab vicinity can be traced as far back as 3000 BC thru the 19th century. Earlier drawings are classified as Desert Archaic, then Anasazi and the most recent, historic Navajo and Ute traditions. Absolute dating of rock art is challenging; relative dating is easier, but remember, this is a branch of science. Wintertime is a great season to be an art hunter in Moab as many of the sites are within a few steps of where you park your car, minimizing your time braving the chilly winter temps for too long. North from Moab take a left on Utah Scenic Byway 279, drive five miles and look for the Indian Writing sign. The panel is 125 feet long and includes animals, abstract shapes and doll like figures. Take 500W to the intersection of Kane Creek Road and travel west for 5.5 miles, just past the Amasaback mountain bike trailhead parking. There will be a pullout on the right, large enough for two cars. Walk 75’ down the embankment to the large boulder, which is encased on all four sides with rock art. The reputed “birthing scene” is on the east facing side of the boulder on the left side. For those who don’t mind a bit of a climb, park your vehicle in the Amasaback parking lot and cross the road to a trail that switchbacks up the rocky slope. (Don’t follow the trail that goes to the right to the wash or you will miss the art). Walk approximately ½ mile up the trail to the top and a 30’ panel from the Formative period is on your left. The art found here is 90’ wide and 30’ high and contains the well known “Moab Man”, snakes, as well as quadrupeds like sheep and deer. This panel also dates from the Formative period. Take Highway 191 south to the golf course turn off (approximately 4 miles from the comer of Main and Center in downtown Moab). Turn left and proceed to Spanish Trail Road approximately 1 mile just past the fire station located on the left-hand side of the road, turn right onto Westwater Drive. Proceed .5 miles to a small pullout on the left-hand side of the road (please do not block or go up the private driveway). Because winter is off-season in Moab, chances are you will have the ancient art all to yourself. More the better to interpret the stories being told- or perhaps create a few of your own!